The digital era has brought a lot of changes and innovation that in some sort of way businesses are compelled to follow. 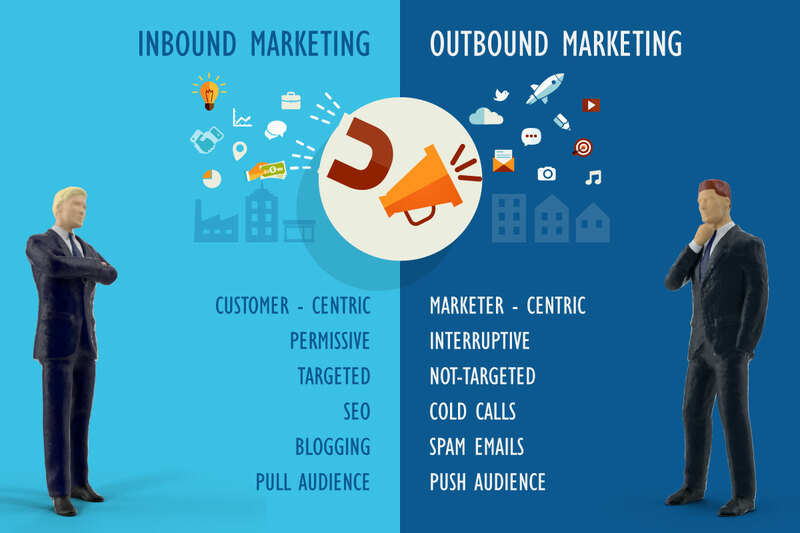 If you operate a business online, you must be very familiar with inbound marketing. Otherwise, chances that your brand has a solid online visibility are very low. Same as outbound or traditional marketing, inbound’s core objective is to convert leads into customers. However, the difference between these two approaches is extensive. Same goes for their effectiveness. The way people obtain information these days has changed. Internet is limitless in terms of content search; therefore, people can have their questions answered whenever they want to. 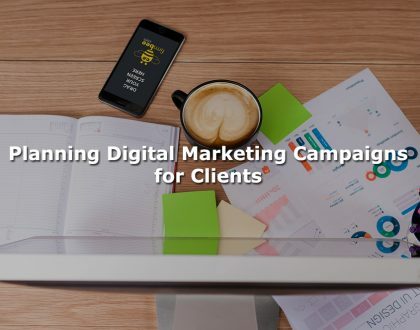 Before going further with the reasons why you need to change your marketing strategy and shift from outbound to inbound, of course, if you haven’t done it already, let’s break down their definitions. Outbound marketing is the strategy of advertising or “spreading the word” about a product, service or event through traditional channels like TV, Radio, Newspaper, telemarketing (cold callings), press releases, direct mail (brochures, postcards, catalogs) and branded marketing. Inbound marketing or online marketing is another approach to advertising your business on the Internet. It is done through blog, social media and website content. This form of marketing only reaches your ideal customers and those who actually are interested in what you have to offer. The main difference between these two marketing strategies is communication. Through outbound or traditional marketing, the conversation about a certain thing is initiated by the marketer without your choice. It’s a one-way communication and most of the time it interrupts you while you’re enjoying a nice movie, documentary, etc. For instance, you’re watching your favorite TV show and suddenly there’s an advertisement of something that you’re not interested at all. It irritates you and sometimes your interest in the show is lost. In this case, the marketer doesn’t think about the customers, the ad is not targeted to a certain audience, and tends to forcefully push its message. On the other hand, inbound is customer-centric, the communication with the marketer is two-way; marketing campaign is made based on a prior research to identify your buyer persona and ideal customers so that it can be targeted to a certain audience; the campaign aims to pull audience by sharing valuable information via content marketing, blogging, and social media. In this case, you optimize your website in order for the users that are looking for your brand can find you easier. This way you attract customers with useful and valuable content while adding value to each stage of the buyer’s journey. The goal of marketing is to turn strangers into visitors, convert them into leads and ultimately have them become customers. After becoming a customer, it’s in the hands of customer service strategy to obtain loyal customers and gain brand promoters. Inbound marketing is the most effective way of driving traffic to your website, generating leads, and exposing your brand. Everything you create must be purposeful; therefore you need to plan your content in order to catch the attention of your prospects. 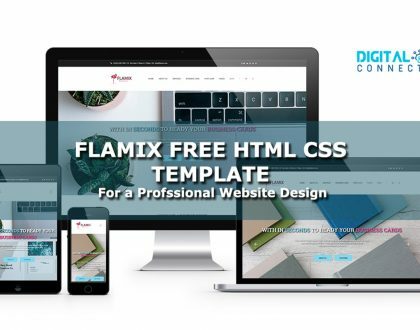 Your content can be published in different formats such as visuals (videos, infographics, slide-share decks), whitepapers, case studies, e-books, webinars, templates, etc. It’s up to you how you want to tell your story and convey your message. How to plan your inbound activities? Identifying and developing your Buyer Persona to be able to target your audience, and determine how you should communicate with them through the three main stages of the buyer’s journey: Awareness, Consideration, and Decision. Keyword Research to determine the words and phrases users use to find your products or services. Optimizing your website for search engines (on-site SEO) with the keywords you chose including URLs, meta titles, meta descriptions, blog content, product/service description, images, titles, subtitles (H2, H3). Search engines like Google, Yahoo and Bing are very smart nowadays and understand what the searcher is looking for. By optimizing your site you inform SEs that you have valuable, relevant and helpful information for the searchers. SEO is the ideal strategy to drive organic traffic and turn visitors into leads. Calls-to-Action (CTA) are buttons that contain attractive phrases that stimulate users to take an action on your website. 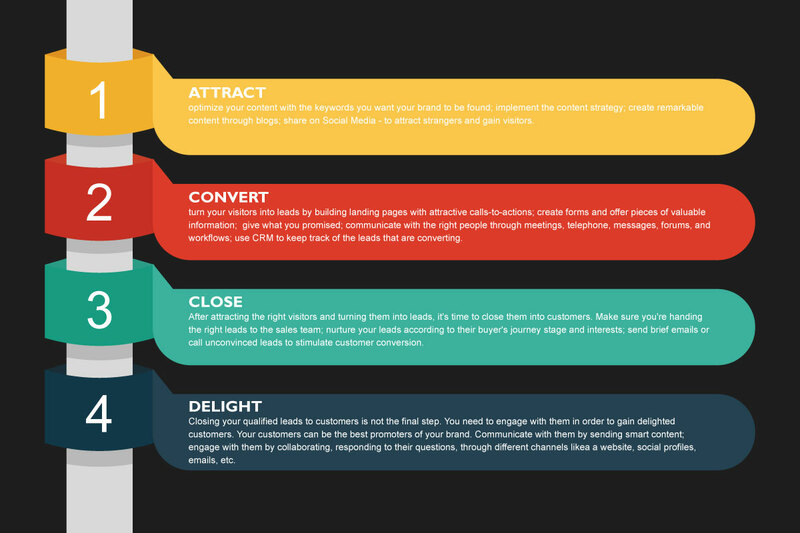 Create colorful, attractive and persuasive CTAs at the end of your landing pages or blog posts. Landing Pages are the pages on your website where the visitors that clicked in the call-to-action arrive. Here you have to put a form so that you can obtain lead information and give them what you promised in the offer. The moment a visitor completes the form and downloads an e-book, receive a free trial or whatever you have to offer, they become leads. Emails are used to send additional information to your qualified leads that have been stuck in the buyer’s journey and are indecisive about completing the purchase process. This helps you convince potential customer sales-ready. However, you should not be too pushy. If the lead doesn’t respond or refuses to communicate with you, you must stop your attempts while letting your lead know that they can always contact you if they change their mind. Blog Posts are a great strategy to keep your audience informed and up to date by creating remarkable content. Write compelling articles and include internal and external links. Internal links are great to help your readers learn more about a certain topic that you have written about or direct them to other pages of your website; whereas, you can use external links to increase the authority of your website by linking with other sources. This way you can show search engines that you’ve made a research and provide your readers with a reference. However, only quality and trustworthy links can help you improve the authority and credibility of your website. Social Media is a very important aspect of IM. According to Statista, in 2019, the number of smartphone owners is expected to be 2.5 billion. This indicates that the number of online searchers and Social Media users will increase as well. The growth implies more potential buyers for you and a more powerful marketing strategy. At the end of the day, you have to be where your buyers are. Distributing your content and info about your business, events, products, and services can help you generate more leads, increase brand awareness, expand customer base and increase your profits. Analytics and Reporting can help you track what marketing strategies, activities, and channels are the most successful ones for your campaign. 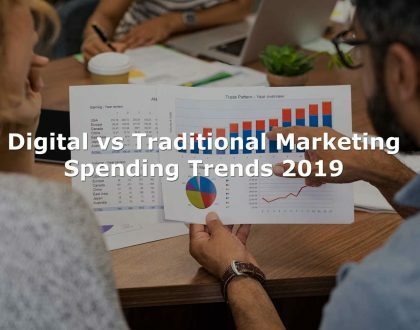 This way you can develop other tactics for underperforming activities, test them and see if changes are bringing more value to your brand and if the conversion rate is improving.